With factory central locking, the “door pins” on each of the doors can be used to individually lock and unlock doors and, on the driver’s door, also lock and unlock all the other doors. The pins are mechanically connected to the lock mechanism by levers and link bars. The assembly incorporates two microswitches with actuating levers located on a back plate (light blue) with locating lugs for the switches and a toggle arm (green). Two reinforced holes in the back plate facilitate fixing to the door. The toggle arm is balanced by an internal flexing beam, between the levers of the two switches with the toggle’s exposed end attaching the operating rod for the door pin via a clevis. To operate either switch, the vertical movement at the end of the toggle must exceed about 10mm. i.e. the pin would have to be pulled up or pressed down a distance of 10mm from its rest position. Sufficient centering force is required so that the inertia of the parts doesn’t cause inadvertent actuation when e.g. the car goes over a bump. If the centering force of the microswitches proves to be insufficient, then there is some latitude for incorporating a spring beam within the toggle arm, acting against a prop that would also be part of the backing plate. The clevis is made in two parts (yellow and brown) which are to clip together to fix to the toggle. The door pin’s operating rod (nominal) screws into the clevis, but there are other possibilities with a different shape of clevis, avoiding the need to form a thread on the end of the operating rod. 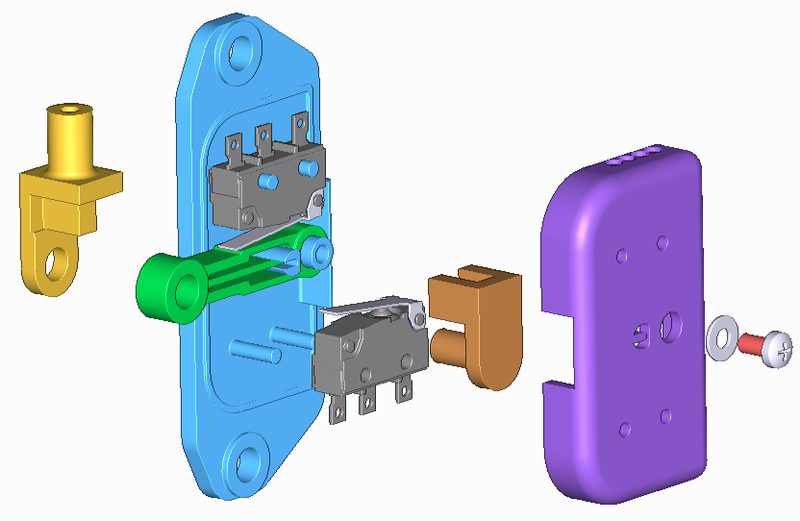 A cap (purple) protects the switches and additionally supports the ends of microswitch locating pins and the toggle arm hinge pin. Motion of the toggle arm is limited by the width of the slot in the edge of the cap. The cap’s outer edge is otherwise located on the back plate by a circumferential ridge and the cap fastened to the back plate using a washer and screw into the hinge pin. Dimples in the cap’s end provide centering to drill out holes to pass wires into the assembly from whichever end happens to be the bottom of the switch when mounted. 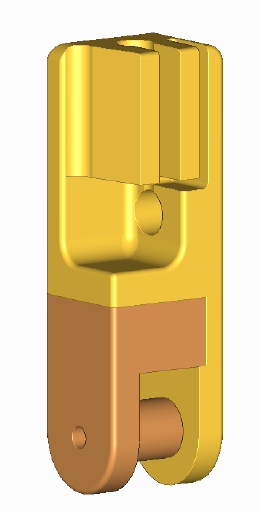 A high ridge on the back plate across the end of the toggle arm forms one side of a guide channel for internal wiring to the “top” switch, with the other side formed by the inside of the cap. The ridge on the back plate also stiffens the back plate. The “oddness” of the shape of some of the parts is due to leaving open the possibility of using 3D printing to make the parts out of ABS plastic. When it’s all snapped together, it should look something like this, but likely less colourful. The remaining gap in the cap’s slot doesn’t require filling to protect the microswitches as they are already sealed. Nevertheless a cover may be incorporated to prevent the ingress and accumulation of dust over the next 20 years. Electrically, access to all 4 switched contacts provides security to ensure that the correct pairs of contacts are closed. The actuator is shown as a dual, split push actuator in either direction, off-centre. A “push” up is performed by pulling the doorpin up.